2010 was crazy here at YouVersion. God did some astounding things. At the beginning of January, the Bible App™ had been installed on slightly more than 3.1 million unique devices. As 2010 draws to a close, it will have been installed on almost 13 million! Another number we watch closely is total minutes spent reading the Bible using the Bible App. At the end of December 2009, our users had read just over one billion minutes. While that’s pretty amazing, as of the time of this writing, users have spent just over 4 billion minutes reading with the Bible App. 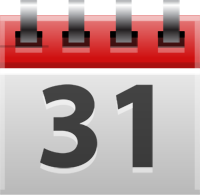 We’ve even invited our users to join us in January 2011 as we try to reach 1 billion minutes in just one month! January: As YouVersion added almost half a million new mobile users with the Bible App right at the end of 2009, we stumbled out of the gate in early 2010. Our core infrastructure simply couldn’t keep up—especially during peak times on Sundays. Throughout the month of January, we added capacity and scaled up our architecture to lay a firm foundation for sustained growth. February: For literally hundreds of millions of Java-enabled devices (not necessarily smartphones), YouVersion offered the Bible App for Java-enabled devices. And just as the update of webOS was being bolstered by the Pre and the Pixi, we announced the Bible App for webOS. April: Although no one even had an iPad yet, we wanted to ensure we’d be able to offer the Bible App for iPad the first day it was in stores. June: YouVersion had been adding connectivity to our platforms for some time, and by summer, simple Facebook and Twitter sharing had come to most of them. Today it’s easy to connect your free YouVersion account and share online. July: YouVersion passed the milestone of 2 billion minutes read using the Bible App. Reaching this position midyear would lay the foundation for us to hit more than 4 billion minutes by year’s end. August: YouVersion began formally offering “Free Bible” pages for those organizations who request them. We wanted to offer partners a way to add value to their existing efforts, while at the same time sharing YouVersion and the Bible App with more people than we could reach on our own. October: As YouVersion’s Android user base continued to grow, we began offering offline Bible versions for Android users, the result of many publishers kindly making their Bible versions available for download, including HCSB, RVR60, ESV, GNT, CEV, Czech Bible21, and NLT. Anticipating that Windows Phone 7 would represent another large user community, we also formally debuted the Bible App for Windows Phone 7. Early November: The film The Social Network arrived in theaters, Facebook announced they had passed 500 million users, and YouVersion released the Bible App for Facebook. We continue to develop this app into a richer user experience right inside Facebook. Mid November: YouVersion hosted a major, live webcast to share some big news: reaching the 10+ million installs milestone and announcing Notes for YouVersion.com. Our viewers generated so much interest that the webcast even became a Twitter trending topic in the U.S. Shortly after, Notes came to BlackBerry, iPhone/iPad, and Android. Late November: Because we rolled out new versions on new platforms over time, different requirements for each led to our logo becoming inconsistent. In late November, we consolidated the Bible App logo everywhere to limit confusion among our users. Mid December: In Apple’s 2010 Rewind, the Bible App™ by YouVersion appeared in iTunes’ Top 10 Free Apps in the Reference category. At one point, the Bible App climbed as high as the number 7 overall free app, passing even the free version of Angry Birds! Late December: YouVersion offered more than 50 Reading Plans across every platform, helping our users easily schedule their time in Scripture. We also introduced Badges, a fun incentive for Bible engagement. Global Share the Bible Day was a resounding success, with users sharing things they loved about the Bible—favorite verses, meaningful experiences, and their faith. Just yesterday, we shared a phenomenal statistic: The Bible App was installed 1 million times in just 11 days…more than one install a second! As you can see, the end of the year saw a disproportionate spike in news and events, as YouVersion and the Bible App gained momentum on the way into 2011. We’re excited about all the things God is doing, and we can’t wait to see where He takes us together next! We’re happy to offer you the opportunity to take part, whether it’s through the billion-minute challenge, participating in Reading Plans, or in our many volunteer opportunities. Thank you for being a part of YouVersion’s success in 2010! In just 11 days, 1 million people installed the Bible App™ on their mobile devices. For a little perspective, that works out to more than one install per second…for 11 days straight! Now millions of people are discovering what you already know: That using tools like the Bible App and others, it’s easier than ever to make the Bible a part of our daily lives. In fact, starting in two days, we’d like to ask you to take part as we aspire to reach 1 billion minutes of reading together in the Bible App—during just the month of January. We’re a small staff here at YouVersion; we don’t personally know a million people. But collectively, we and you actually know millions—and what’s more, we’re connected to billions! You are an important part of a revolution taking place right now: Millions of people around the world are discovering the Bible, or in some cases rediscovering it. God is using your passion and efforts to share the Bible (His Word) with millions of others. 1 million installs in 11 days seem huge. But even more significantly, 6,869,358,569 more people still need to know about the Bible App—and each one of us has a role to play. Keep posting. Keep tweeting. Keep sharing. Keep engaging. There is so much more to come! We’ve been telling you how Reading Plans can help you engage with God’s Word. A Reading Plan breaks your Bible reading into manageable chunks, making your time in the truth every day simple and straightforward. Whether you’re reading the whole Bible in a year (or in 90 days! ), or just select parts, or even the most basic daily devotions, the Bible App™ by YouVersion has more than 50 plans to help you meet your goals. 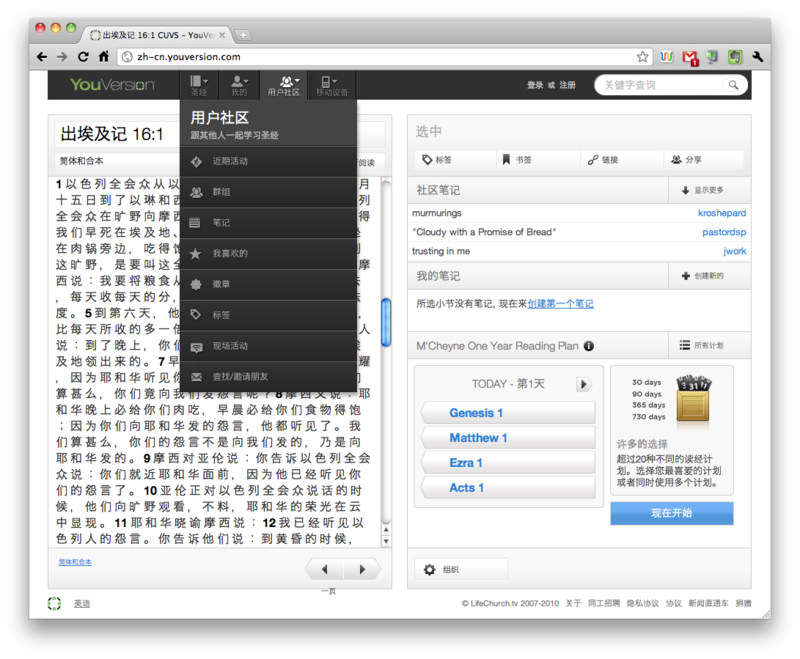 We’re so excited to announce that, with help from our friends and partners at http://jidutu-wiki.org/, we now offer our interface in both Simplified Chinese and Traditional Chinese, available immediately on YouVersion.com. Both languages are also coming soon to the Bible App™! In 2010, China’s population grew to well over 1.3 billion people (that’s with a B!). By the late 2010’s, it’s projected that China will pass 1.4 billion. It’s estimated that 3%–4% of China’s population follows Christ, with the Lord adding to their number every day. YouVersion’s vision has always been to make the Bible an easy-to-use resource. As people’s lives move more onto the web and onto mobile devices, we want to be sure the Bible is freely available to them—wherever they are. And of course we’re always thrilled when God gives us the opportunity to get His Word to different people in their own language! We consider this feature still in “Beta.” We have some details we’re working out and a few areas we know need more thorough translation. But it’s live and online right now! To access either language, simply click the language link at the bottom left of YouVersion.com, and switch to the one you want. If you have friends who might be interested in this feature, please let them know about it. We’d love to hear what they think on Facebook and on Twitter. Would you like to see YouVersion.com and the Bible App in your own language? We want to hear from you! Please complete this simple form and let us know what you can do to help. Join us! 1 Billion in 1 Month! We mentioned this during our webcast earlier this year, but now the moment is upon us. And of course, we’ll need everyone’s help to pull it off. Here’s what we’d like to do: During just a single month, the month of January, we’d love to see users of the Bible App™ spend at least 1 billion minutes reading the Bible. (We can do this! You guys just recently passed 4 billion minutes total!) We’ve even added a page to our website to keep track and to help you out with resources. Besides some of the things we’ve already shared that you can do—rating the Bible App in iTunes, talking to your friends about the Bible, sharing on Twitter and Facebook, even raising Bible awareness during the Christmas season—the key now is to read. Read like crazy during January. We’ve done a lot to prepare and help you, making the Bible App easy and accessible, so you can always have it with you, whether you’re on your iPhone, iPad, Android, BlackBerry, Windows Phone 7, webOS, or even in Facebook! All of that has been building toward this one moment. It’s here. Use Reading Plans. Probably the greatest tools we’ve seen so far that can help you (and your friends) engage with the Bible are Reading Plans. Whether you’re brand-new to reading the Bible, or you’ve set 2011 as the year you’re going to read through the entire thing, or even if you want to read it all in just 90 days, there’s a Reading Plans for you. Find one you like and sign up with your free YouVersion account today. At YouVersion, we love the Bible. It’s why we do what we do. We saw some crazy, thrilling numbers during 2010. But we’re convinced God is up to something even bigger. And we believe that helping other people fall in love with His Word is the most important thing we can all do to be a part.